BUYSOUNDTRAX Records presents the soundtrack for SUNDOWN: THE VAMPIRE IN RETREAT, featuring music composed by Richard Stone (PUMPKINHEAD, TINY TOON ADVENTURES, ANIMANIACS, PINKY AND THE BRAIN)and conducted by Allan Wilson for the 1989 cult horror film directed by Anthony Hickox (WAXWORK, HELLRAISER III, FULL ECLIPSE), written by John Burgess and starring David Carradine, Morgan Brittany, Jim Metzler, Bruce Campbell, Deborah Foreman, Maxwell Caulfield, John Ireland, Dana Ashbrook, M. Emmett Walsh and George ‘Buck’ Flower. SUNDOWN tells the story of the people of a small American town in the middle of nowhere called Purgatory. The townsfolk of Purgatory are a mean and ornery lot for one very good reason… they’re vampires! Lounging around by day, wearing extreme sunblock, they wait for the sun to go down and then feast with gusto. The town’s leader, Count Jozek Mordulak (Carradine), has eliminated the need to hunt for fresh blood by having a machine installed that synthesizes an alternative to human blood, thus eliminating the need to hunt for victims. When the machine begins to malfunction, Mordulak sends for David Harrison (Meltzer) to service the machine before the townsfolk get out of control. Harrison answers the call for help and arrives in Purgatory with his wife and two daughters. Unknown to David and his family, a Fundamentalist vampire named Jefferson (Ireland) has been planning a coup to overthrow Mordulak and return to the old ways of hunting humans for their sustenance. Meanwhile, a direct descendant of the legendary vampire hunter, Abraham Van Helsing (Campbell), has also arrived in Purgatory with a half-cooked plan to slay all the vampires, a plan that quickly backfires. David and Van Helsing soon find themselves right in the middle of the escalating civil war between Mordulak and Jefferson. To score SUNDOWN, director Antony Hickox was looking for a composer who could provide a rousing orchestral score comparable to the work of Elmer Bernstein or Ennio Morricone from many classic Westerns. However he lacked the monetary resources to hire either of those two legendary composers. The trend in horror films at the time favored electronic scores over orchestral scores for this very reason but Hickox was determined to get the right score for his film. Choosing raw talent over name recognition, Hickox hired Richard Stone, a gregarious up-and-coming composer who was eager to demonstrate his eclectic orchestral style and flair for aggressive storytelling. Stone had already established himself as a music editor for several prestigious composers including Georges Delerue and Maurice Jarre. His earliest feature film composing credits included SUMMER HEAT, NORTH SHORE and PUMPKINHEAD, which he scored for renowned make-up wizard and first-time director Stan Winston. Backed by an elite team of orchestrators including Conrad Pope, Philip Giffin and Mark Watters, Stone's music for SUNDOWN: THE VAMPIRE IN RETREAT reflects a spirit and passion for cinema seldom expressed in low-budget filmmaking and usually discouraged. The final result is a large scale orchestral score sure to appeal to fans of great filmmusic. 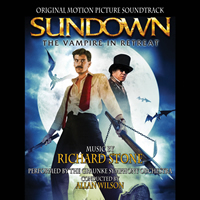 BUYSOUNDTRAX Records brings SUNDOWN: THE VAMPIRE IN RETREAT to digital, featuring music composed by Richard Stone and conducted by Allan Wilson, performed by the Graunke Symphony Orchestra, with remastered sound by Digital Outland. The booklet includes new liner notes by writer Brian Satterwhite on the film’s production and the creation of this exciting large scale orchestral score.